Developing from Ford’s 3 times award winning engine we have pushed this design to another level. Of course that was just the baseline runs, but we can supply an ECU and wiring to enable those power and torque levels to be available in your standard engine, without any need to remove the engine from the car. 200bhp at 6500 rpm and a peak torque of 195 lbsft, still at 2500 rpm. Next stage was to remove the fuel flow restriction and that requires running port injection phased with GDI. The one problem with GDI is the tight limit to the time available to inject the fuel; only possible when both valves are shut. But with port injection available any time during the engine cycle – problem solved. 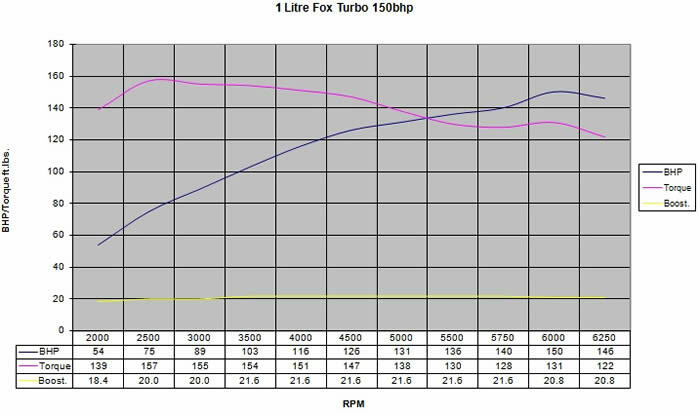 A bigger turbo was required to keep up with the cylinder head flow rate now, and with no fuelling limits the stunning result was 302bhp at 6500 rpm, still a remarkably flat torque curve peaking at 2500 rpm. Our all new intake manifold plenum with port injector mounts and a bigger throttle body final upgrade to enable this performance level. At the bottom end the fuelling requirement is not much different to the standard motor, so low end low throttle drivability is maintained.